Description Gretchen Esping, Lindsborg, will be the Artist-in-Residence at the Red Barn Studio, 212 S. Main St., Tuesday, May 22 through Thursday, May 31 and will be working on a unique paper casting process in the Red Barn Studio courtyard. Using pre-pulped paper and found objects, Esping will complete a series of mono casts. The paper pulp is laid on a bed created of found objects, forming a detailed reverse impression. 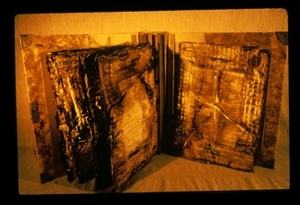 Esping began working with handmade paper in the mid-1970’s. While in graduate school at the University of Iowa she took a graduate course offered by the Iowa Writer’s Workshop with the focus on limited edition fine-press books. It is through this course that she began to think about both paper making and fine-press book binding and now, even paper casts. Gretchen Esping’s formal education was at Bethany College with a B.F.A., an M.A. from the University of Iowa and a Ph.D. in Education from Kansas State University. She has taught a course in Humanities at K-State Salina for 9 years and high school and elementary school at USA 500 in Kansas City, KS and a substitute art teacher in Lindsborg and Canton/Galva KS. Esping has had one person shows in cast paper at Gallery Etc. Etc. Etc. and Idum Theatre Gallery, both in Umeå, Sweden, and a major paper work at the Hyatt Regency in Denver, Colo.
Add Gretchen Esping to your free online travel itinerary.